United States; State Postal History, Early California Lot, 28 total, all late 1800s with many better usages incl. Spanish Flat, Morman Island, Red Dog, Johnsons Ranch, Knights Ferry, Fosters Bar, Bidwells Bar and many others, well worth a look, Fine. United States; State Postal History, Accumulation of Oregon Postal History, Several hundred loose in a medium box, good range from mid-19th Century up through modern times, mostly small towns, many sleeved and priced, a few Whittlesey-listed items, and Helbock-listed items mostly 2's, 3's, and 4's, but a stray 5 or two might have gotten through, also some hard to find stations and branches, mostly Fine to Very Fine and collectible. United States; State Postal History, Oregon Postal History Accumulation, Over 300 covers, cards and postal stationery mostly earlier 20th Century, wide selection of towns and cancels, generally Fine to Very Fine. United States; State Postal History, Accumulation of Washington Postal History, Two hundred or more sleeved cards and covers in two medium boxes, mostly small towns, Helbock-listed items in the range of 0 to a few 4's, but even some 5's slipped through, Washington-related ships covers, advertising, Doanes, 4-bars, numerous 1933 Frigate Constitution that could be a separate presentation, postmaster signed, flights, a very few 19th Century, but most early to mid-20th Century, better items include Baker, Lookout, Napoleon, Rock Lake, Tweedie, an 1898 Spokane involute flag, and even a few better RPO's, a few loose and unfiled items, these last being in somewhat mixed condition, Fine to mostly very fine, generally Fine to Very Fine. 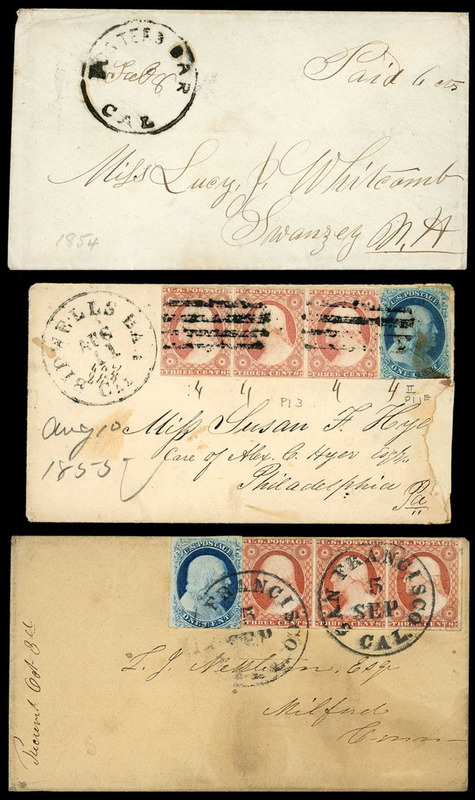 United States; State Postal History, Washington State Collection, approx. 1000 covers and picture postcards from territory to 1980's in G&K binders plus a shoebox of misc., mostly Seattle and Tacoma postmarks, incl New Tacoma Territory, generally Fine to Very Fine. United States; State Postal History, Western Accumulation, Half carton of few hundred containing mostly early to mid 20th Century covers, picture postcards etc., North Dakota westward, noted D.P.O. 's, generally Fine to Very Fine. United States; State Postal History, Western States Stock, 544, sleeved and priced, mostly classic to 1940's period, consists of Arizona (77), California (125), Colorado (213), Mexico (86), Oregon (12), and also Montana, Utah and Washington with only a few, typical condition, retail $6, 395, generally Fine to Very Fine. Ex. Friedman "Cover Corner" Stock.